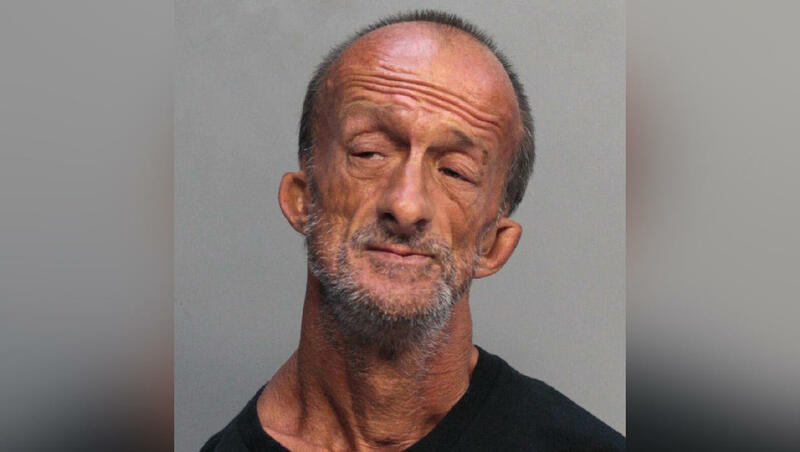 A homeless artist in Miami Beach who has no arms managed to stab a tourist with a pair a scissors, police said. Jonathan Crenshaw, who is known in the touristy South Beach area for painting with his feet on the streets, allegedly attacked a visitor from Chicago after midnight on Tuesday. Crenshaw and the tourist, Cesar Coronado, gave conflicting stories about what led to the stabbing, according to an arrest report obtained by CBS News. Coronado, 22, told cops he was walking with a female friend when Crenshaw jumped and attacked him after he simply asked for directions. But the armless artist claimed Coronado approached him and punched him in the head, and he retaliated by stabbing Coronado twice and walking away. Officers found Coronado found bleeding from his left arm and he was treated at a hospital. Crenshaw, 46, faces a felony battery charge and is being held on $7,500 bond. Crenshaw has attracted tourists and local media for years with the paintings he creates and sells on the streets. He's also had regular run-ins with the law. Court records show his criminal history dates to 2006 and includes charges for disorderly conduct, resisting officers and trespassing. He has also faced four previous battery charges, including a conviction in 2014 for felony battery of an officer, which led to a sentence of 180 days in jail. Court filings noted that Crenshaw's fingerprints couldn't be collected because he has no arms. In a 2011 profile in the Miami New Times, Crenshaw would not discuss the condition that left him without upper limbs. He made wild and unverified claims about his past, saying that he had more than 200 children and fathered the first one when he was 8. "Sometimes I wish I were dead," he told the New Times. "I'm not trying to kill myself or anything. But then I wouldn't have to suffer."